Have been looking for a sturdy and attractive white resin wicker rocker for several months. Certainly made a great choice with this purchase. It arrived within a week of placing the order. Without hesitation, I highly recommend this rocker based on cost, comfort, and quality. 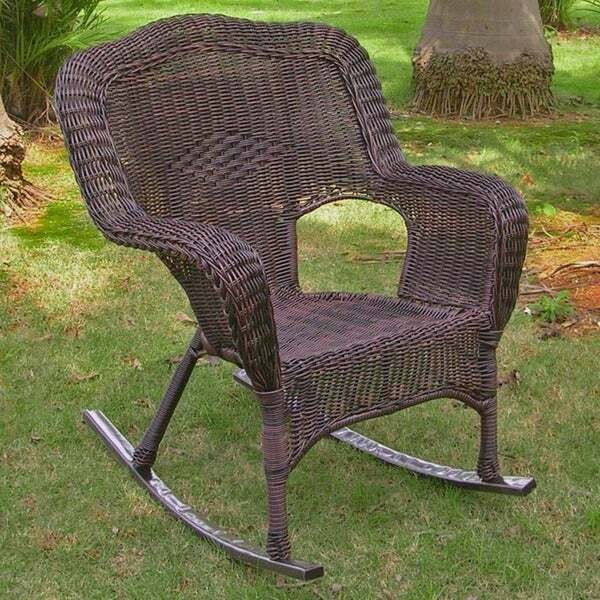 Relax in comfort and style with this woven resin wicker rocking chair by International Caravan Home Furnishings. Place it on your patio, sunroom or yard to enjoy on hot summer days and warm nights. It is perfect for guests and family gatherings. Select from a variety of finishes to help accent your outdoor venue. Use the chair regularly with assurance that it withstands regular use due to its strong powder-coated steel frame. With a weight capacity of 275 pounds, this rocking chair is sure to be an integral part of your patio or lawn for many years to come. Dimensions 30.0 In. X 26.0 In. X 40.0 In. When attaching the rails the cheap screws do not center into the wooden posts. One screw head stripped and another simply broke off. I bought this chair for my 84 year old mother and won't let her use it for fear of it coming apart. It is pretty but unsafe. I never return things because I am essentially lazy and repacking this fiasco would be a major headache. If I had bough it locally I'd put it in my son's truck and take it back as is. Alas I have a nice looking worthless chair. If this was my business selling this import I would discontinue this line. I also bought a deck lounger made in Viet Nam and it is beautiful and the quality is far superior to this chinese garbage. The chairs are good looking and comfortable enough-I added a cushion. The rocker holes do not match up to the legs no matter how I try on either chair. Maybe it does take man power? They seem to be about an inch off and no amount of adjusting does it. They are fine as stationary chairs however. I agree with other reviewers. I had to ask for the rocker runners for one chair to be replaced because the holes didn't line up. When the replacements arrived, they were still off but i was able to push the chair legs together enough to fit the legs into the holes and then it was fine. Perhaps this is by design however one set was perfectly aligned. This chair was easy to put together--just affix the rockers with the enclosed screws, holes are predrilled so you only need a screwdriver. The arms of the chair are at just the right height so you can rest your arms comfortably and the back is angled so you are not leaning too far back. Just add a cushion and you have a perfect spot to sit and read your favorite book or magazine, or just sit and sip a beverage and take in the view from your porch or patio. I would use this indoors, too; the wicker looks good enough to pass for the real stuff, but it is a synthetic wicker that works well outdoors so you don't have to worry about leaving it out in the weather. I've had other wicker chairs and this one is the most comfortable one I've ever had. The rockers have to be assemebled...not fun! Please dont surprise us with the assembly of the rockers. Nothing matched and it was annoying and very difficult to deal with. I really like the quality and price of this rocking chair but it was very difficult to put the runners in place. It took 2 strong men to put them in place. Other than that the chairs are very attractive and I'm very pleased with them. The International Caravan PVC Resin/ Steel Frame Camel Back Rocker is exactly as shown and is good quality. I appreciate being able to order products on line and get them quickly from Overstock. I was very pleased with the looks, durable construction; however, it is not very comfortable. The chair is positioned too far forward on the rockers making it sit upright and not back. It is not as comfortable as my other wicker resin rocker I purchased in a store. I feel that the design is flawed which causes the rocker to not sit back comfortably. It would be fine for a straight chair....not a rocker. It is a very pretty chair but not a comfortable rocker. The price is fair. Love this rocker, and love the resin "wicker" furniture as it weathers great and we have a set on the porch which we love. Dont bother. Just buy the chairs because the rockers are not going to work!!!!!!!!!! Love these chairs. Have recommended them to a lot of friends who want them. Love, love, love this rocker! Roomy & comfortable with a cushion. The price is a little steep, but the item is made very well & will probably withstand the outdoor elements for years to come. Rocker is very comfortable. It's in my sunroom right now so I have a concern about the screwheads on bottom of rocker sctraching my tile floor. I put pads over the heads but not sure if they will stay on very long. Once rocker is on deck I won't worry so muck about it. My only concern will be having a chance to enjoy it with other people trying it. The chair sits a little lower to the ground than I like but it is very comfortable and looks well made. It should hold up well. I added a seat cushion for additional comfort. Beautiful quality for the price. Amazing product, love it for sitting on my porch in the summer and watching the world go by! It has lasted a few years now and it still looks amazing!!! Have had for about 8 years and is just now showing signs of aging. "It looks like you're sold out of white. Any chance of getting more of those in?" We do not know if the white rocker will come back. We do use Bret Michaels however! He can be found at the bottom of this page. "Has the problem of the holes not aliqning been fixed? I would like to purchase but will wait till these problems are fixed!" Hello Donna J R., this issue should be resolved, there should be no issues with the holes not aligning correctly. Have a great day! "CAN YOU TELL ME THE BRAND NAME OF THIS ROCKER PLEASE"
Hello highlandermac, we are unable to disclose the manufacturer of some of our products; however, Overstock.com stands behind every product we sell. When necessary we can contact suppliers if a product issue arises. Thank you for shopping with us. "What is the dimensions of only the seating area and what is the weight limit?" The seating area is 19 inches x 19 inches. The weight limit is 275 lbs. Please feel free to contact us again with any further questions.